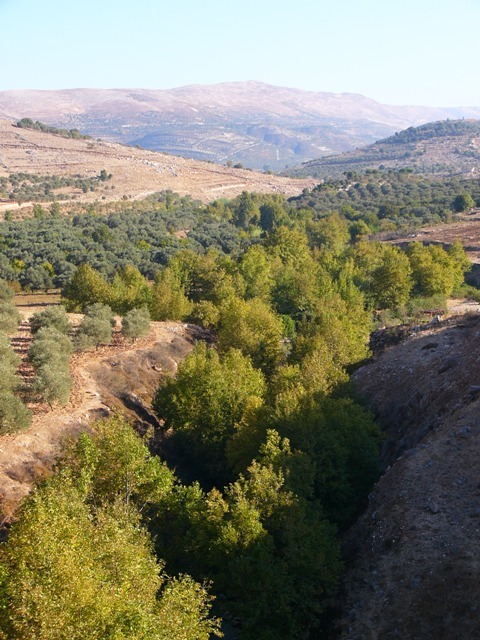 Location: Southern Lebanon between Marjayoun and Hasbaya, west of the Hasbani River. Village lies on the Rift valley flyway, well documented for migratory raptors and soaring birds. Explanation: A1 presence of globally and regionally threatened soaring bird species in Lebanon such as Dalmatian Pelican, Greater Spotted Eagle, Egyptian Vulture, Pallid Harrier, Imperial Eagle, Lesser Kestrel, and Corncrake stresses the importance of this area on an international scale. A3 evidence of 5 biome restricted species breeding: Masked Shrike, Upcher’s Warbler, Sardinian Warbler, Cretzchmar’s Bunting and Black-headed Bunting. A4iv Very large numbers of migrating soaring birds in spring and autumn, including at least 17 species. 60,000 Common Crane witnessed on one day in February 2005 sufficient alone to ensure IBA status. Large numbers of European Honey-buzzard, White Stork, and White Pelican have been seen in autumn. Other wildlife interest: bat, Rock Hyrax, Wild Cat, Red Fox, Jackal, possible Otter, Wild Boar, freshwater fish, Spur-thighed Tortoise, Chameleon, lizards, amphibians, and scorpions. Current conservation measures & future plans: Declared as Hima by municipality – hunting banned, grazing restricted, management plan put in place, Site Support Group and SPNL chapter initiated for conservation and awareness issues.